The heavy duty industrial curtain walls are easy to roll from one side to the other. This retractable barrier can be opened and closed in only a few seconds. At only about 1/3rd of the cost of a fixed permanent wall, these industrial vinyl curtain walls are both economical and quick to install. Designed from a variety of materials based on your application, the industrial curtains are built to last while preserving your budget. 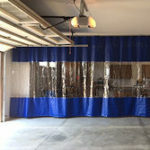 AKON Quick Ship Industrial Curtains are a cost saving solution for areas in need of dust, temperature, and work space zoning. They can be a temporary solution or a long term solution that is both aesthetically appealing and inexpensive. Designed to slide open quickly and easily on their roller hooks, the curtains provide rapid access for product and people to move through. They also meet fire retardant requirements as they are constructed of an 18 oz. polyester reinforced vinyl that has the NFPA-701 fire rating. Industrial curtains come with grommets at the top making hanging the curtains quick and easy with or without the curtain track. Industrial curtains are about 1/3rd of the cost of other separation methods such as rigid walls or panel systems and are easy to store. 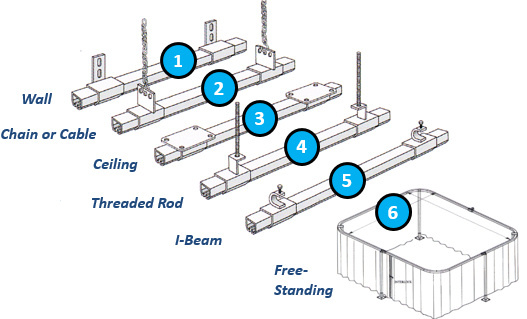 Industrial curtain walls are ideal for separating workers for welding, washing, packaging and many other operations. Industrial curtains help reduce noise due to the thick PVC they are made from which makes for a more comfortable work environment. industrial curtain walls are a quick easy to install solution for making work zones or dividing up warehouse space. For example, if a facility has different manufacturing processes in a large area the curtain walls can be used to form smaller work zones. That will help distinguish between different work processes, protect workers and products from other processes, and contain cross-contamination. Each industrial vinyl curtain wall is custom designed to your exact specifications. Simply click the request for quote button at the bottom of this page and our form builds your quote for you. You can choose your preferred color, width, height, vision panel and curtain wall material.